It was a tightly contested game between MHS and old rivals Wesley College. 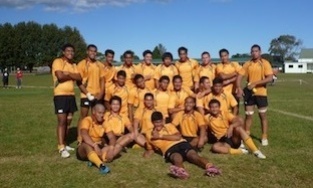 Alamanda Motuga scored Manurewa's only try five minutes into the second half, with penalties and conversions leading to a 79th-minute score of 13-13. Mark Talese came under immense pressure when a penalty was awarded to Manurewa in the last minute of the game. Much to the relief of the Manurewa supporters, he kept his cool and slotted the winning three points. The weekend was also successful for our Colts Gold rugby team, who beat James Cook High in their season final.